New Zealand team is all set to play their Second Test at Christchurch, Hagley Oval, on 30th of March Against England. In Today’s Dream11 Fantasy Cricket Prediction ENG vs NZ 2nd Test will share all the details related to the second test match. To make a perfect team you need to know about players recent and past performance, pitch report, playing condition, likely 11, weather report, best team for fantasy leagues and dream 11, key players, best choice for captain and Vice-Captain, who will win the match and what astrology has to say about toss prediction. 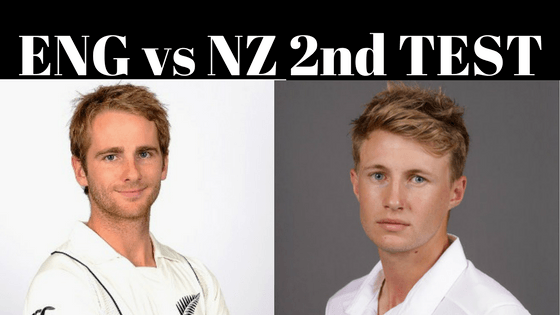 Who Will Win the 2nd Test Match Between NZ vs ENG? Date: 30th March 2018(Thursday) – 3rd April 2018(Wednesday). Match: England Tour of New Zealand, 2018, ENG v NZ, 2nd Test. Time: 03:30 AM IST, 10:PM GMT. Average first inning score is 308. Average second inning score is 299. Average third inning score is 271. Average fourth inning score is 131. Highest total on this ground was 505/10 in 153.1 overs by AUS v NZ. Lowest total on this ground was 133/10 in 55.5 overs by PAK v NZ. Highest chased on this ground was 201/3 in 54 overs by AUS v NZ. The pitch has a record of being hard and bouncy and it is expected to be same in today’s match. The seamers will enjoy bowling on this pitch as the pitch will support the seamers. The pitch will also support the batsmen as it has good bounce. The spinners will find it difficult to bowl on this ground. In recent five games, Black Caps have won 2 out of five matches whereas England has won 3 out of 5 matches. New Zealand has won last two matches and they are aiming to win 2nd series in the home against England in New Zealand. On Friday and Sunday, it will be mostly sunny and humidity will be 75% on Friday and 68% on Sunday. On Saturday, Monday, and Tuesday the weather is expected to be partly cloudy but there is no sign of rain and the humidity will be 63%, 61% and 60% on Saturday, Monday, and Tuesday. Martin Guptill, Kane Williamson (c), Ross Taylor, Colin de Grandhomme, BJ Watling (wk), Tim Southee, Ish Sodhi, Henry Nicholls, Trent Boult, Matt Henry, Jeet Raval, Neil Wagner, Tom Latham. James Vince, Alastair Cook, Jonny Bairstow, Jack Leach, Mark Stoneman, James Anderson, Craig Overton, Dawid Malan, Stuart Broad, Joe Root, Ben Stokes, Mark Wood. This team is a dream team of the previous match played between New Zealand and England. This team won the grand league. You can take reference from this team. The demo team for NZ vs ENG is below in this post. Ish Sodhi has joined the squad in place of Todd Astle and likely to feature in playing 11. Martin Guptill will not get chance to play in 2nd Test also. Except Astle Williamson will go with the same playing 11. Kane Williamson (c), Ross Taylor, BJ Watling (wk), Tim Southee, Ish Sodhi, Henry Nicholls, Trent Boult, Jeet Raval, Neil Wagner, Tom Latham, Colin de Grandhomme. Moeen Ali and Chris Woakes are not playing. Uncapped Jack Leach will replace Ali and Mark Wood will replace Woakes in the 2nd test match. Rest of the team will be same. Alastair Cook, Jonny Bairstow, Jack Leach, Mark Stoneman, James Anderson, Craig Overton, Dawid Malan, Stuart Broad, Joe Root, Ben Stokes, Mark Wood. Jonny Bairstow: Last match Bairstow scored 0 and 26 runs and contributed 10 points. 49.72% of the users have selected him in their teams. BJ Watling: Watling has scored 31 runs in the last match and contributed 28 points. 47.76% of the users have selected him in their dream team. Pro-Tips: Both the players are the good options you can select any one of the above players. If you are playing with multiple teams make a combination. Joe Root: In the first inning he couldn’t score but in the second inning he scored 51 runs and contributed 10 points. He is one of the essential players for any dream11 team as he has to perform if England wants to win. 72.31% of the users have selected him in their teams. In last 10 matches, he has scored 798 runs with an average of 49.87. Kane Williamson: One of the most reliable and must have player. He scored 102 runs in the last inning and contributed 67.5 points. In last 10 matches, he has scored 788 runs with an average of 56.28. 83.2% of the fantasy players have selected him in their winning teams. Henry Nicholls: The rising star of NZ team. In the last inning, he scored 145 runs and contributed 91.5 points. 62.59% of the users have taken him. Mark Stoneman: In the last match he scored 11 and 55 runs and contributed 8.5 points. 46.12% of the users have chosen him. Ross Taylor: How can anyone forget his tremendous form in last ODI. In the last inning, he scored 20 runs and contributed 13.5 points. 34.42% of the users have selected him. Tom Latham: Latham scored 26 runs in the last game and contributed 20.5 points. 41.79% of the users have selected him. Alastair Cook: Cook has scored 5 and 2 runs in last innings and contributed 4.5 points. In last 10 matches, he scored 743 runs with an average of 43.70. 30.19% of the users have selected him. Pro-Tips: All players are good you can make a combination from the above list. You can also take players from playing 11 as it may lead you to win the grand league. Ben Stokes: Stokes has scored 0 and 66 runs in the last game and contributed 36 points. 71 .67% of the users have selected him in their team. Colin de Grandhomme: Colin couldn’t contribute with the ball but he scored 29 runs and contributed 20 points. 34.27% of the users have selected him in their team. Pro-Tips: Ben Stokes is a player who you cannot avoid so keep him on your team. For multiple teams make a combination from the list. James Anderson: Anderson took three wickets in the last match and contributed 26.5 points. In last 10 matches, he took 46 wickets. 63.27% of the users have taken him in their team. Trent Boult: Boult took 6 and 3 wickets in the last game and contributed 86 points. 89.47% of the users have selected him. Tim Southee: Southee took 4 and 1 wicket in the last match and contributed 65.5 points. In last 7 matches, he took 36 wickets. 77.8% of the users have chosen him in their dream team. Neil Wagner: Wagner took 3 wickets in the last inning and contributed 31.5 points. In last 10 matches, he took 48 wickets. 28.27% of the users have selected him. Stuart Broad: Last match he took 3 wickets and contributed 26.5 points. In last 10 matches, he took 27 wickets. 48.81% of the users have selected him in their teams. Pro-Tips: Try to keep seamers in your team as the pitch will help fast bowlers. Pro-Tips: The above players are likely to perform so you can take captain and vice-captain from the above list. You can also make Captain of the key player’s list. New Zealand has totally outplayed England in the previous game and in today’s match, England seems to be week team as they haven’t performed from the ASHES. Our Astrology department predicted that New Zealand will win the match. It is expected that team winning the toss will decide to bowl first. Our Astrology expert says Black Caps will win the toss and they will bowl first. Conclusion: Once again we are writing that if you want to win, read the details carefully. This is it for Today’s Dream11 Fantasy Cricket Prediction ENG vs NZ 2nd Test. Subscribe to our notification to get latest updates. GOODBYE!